Painting on Canvas | 18" x 30"
Painting Charcoal on Canvas | 29.5" x 35.5"
Painting on 100% Acid Free Reg Paper | 40" x 60"
Painting on Canvas | 12" x 12"
Painting Mixed Media Acrylic Charcoal on Canvas | 18" x 12"
Painting on Canvas | 24" x 12"
Painting Acrylic and Charcoal on Canvas | 12" x 12"
Painting Charcoal on Canvas | 12" x 12"
Drawing Charcoal on Canvas | 12" x 12"
I have had the opportunity of growing up in mother nature’s lap and also had the benefits of a city life, this experience has lead me to gain a deep appreciation for this world and humanity. In my works, I love taking people to a better place, to remind them of all the beautiful, historic places that this country has. I enjoy creating a melange of cultures and geographic places with a veil of rain on them. Through my compositions I also keep my connection with nature alive and I love sharing the same with my viewers. 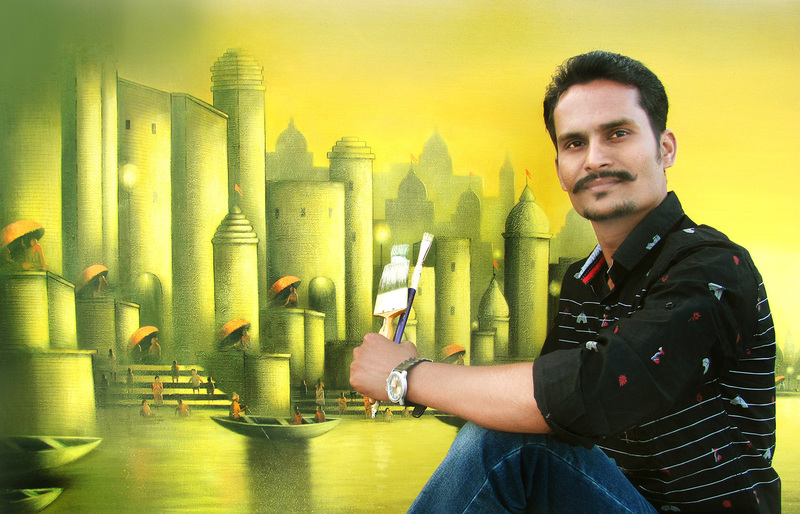 Somnath Bothe holds a diploma in painting and art education from Abhinava Kala Mahavidhyala, Pune. His passion for painting started when he realised the intention of paintings was deep, far sighted and could almost make history. Somnath has been awarded and recognized numerous times for his compositions from organizations across the country. His paintings include both portraits and landscapes encompassed with bright, vibrant colours.